Tracy asked me what I wanted to do on my 59th birthday. After a moment of thought, I said, “Let’s go visit something that’s even older than I am.” Of course, in California, this is not an easy task, since once something gets old, they usually tear it down. This was going to take some thought. 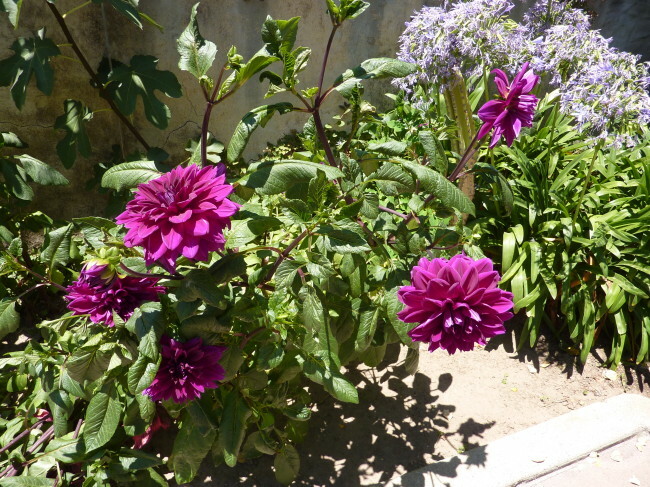 Then it came to me. 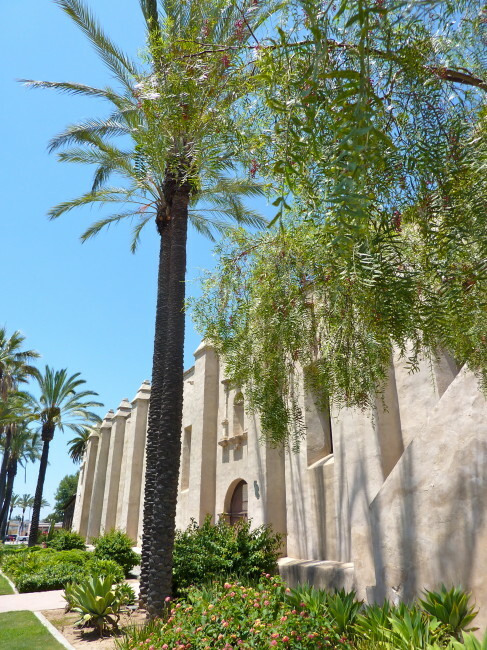 “We haven’t ever gone to visit any of the California missions. Let’s go to one today?” So, we were off to the Mission San Gabriel Arcángel, located near where we live. 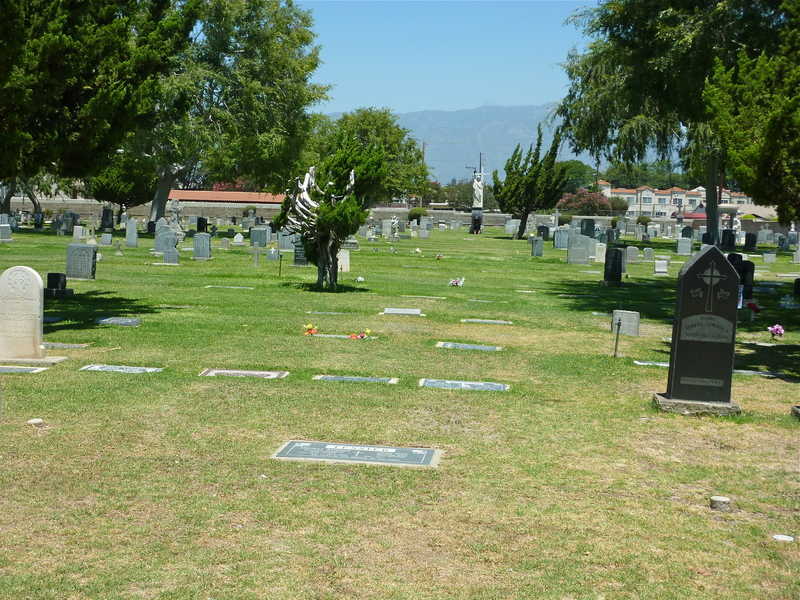 I hadn’t been here since 1978, when I was in a friend’s wedding. With temperatures approaching the mid 90s, we could have picked a better day, but there’s no time like the present, we thought. After parking, we strolled past the fountain, a statue of Father Junipero Serra and, before entering the gift shop to purchase our tickets, we happened upon the large cemetery outside the Mission. 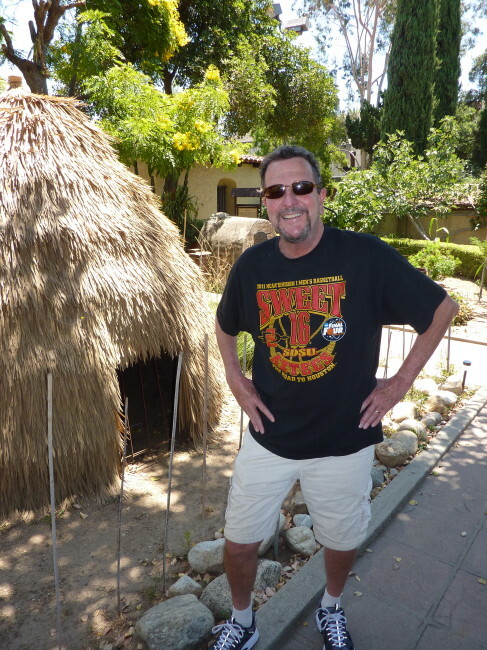 Once inside the gift shop, we paid our five bucks each and our first Mission mission was underway. 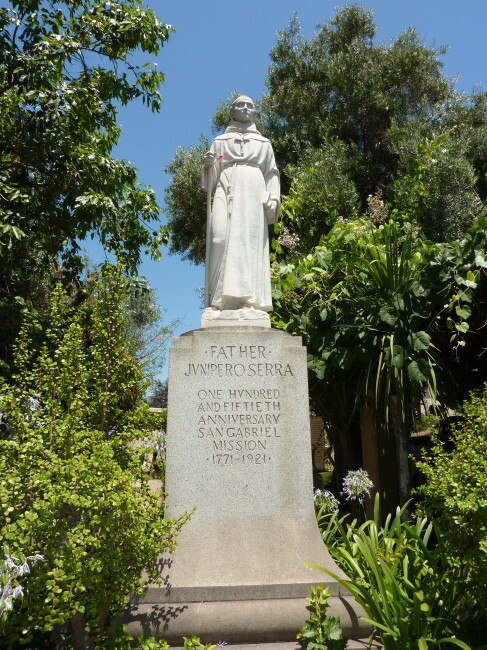 The Mission San Gabriel Arcángel was founded back in 1771 and designed by Father Antonio Cruzado, who was from Spain. 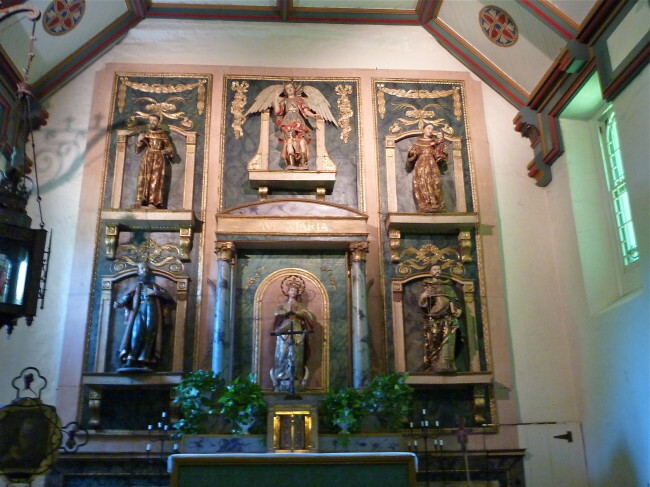 Much of the ceilings have been damaged by earthquakes, but the more than four foot walls are originals. It was named after the Archangel Gabriel and is known as the “Godmother of the Pueblo of Los Angeles.” It is the fourth of the 21 missions founded. Once inside, the first thing you come upon is the Fountain Plaza, which not surprisingly has a fountain and a plaque honoring Raymond Catalan who restored the Mission gardens. 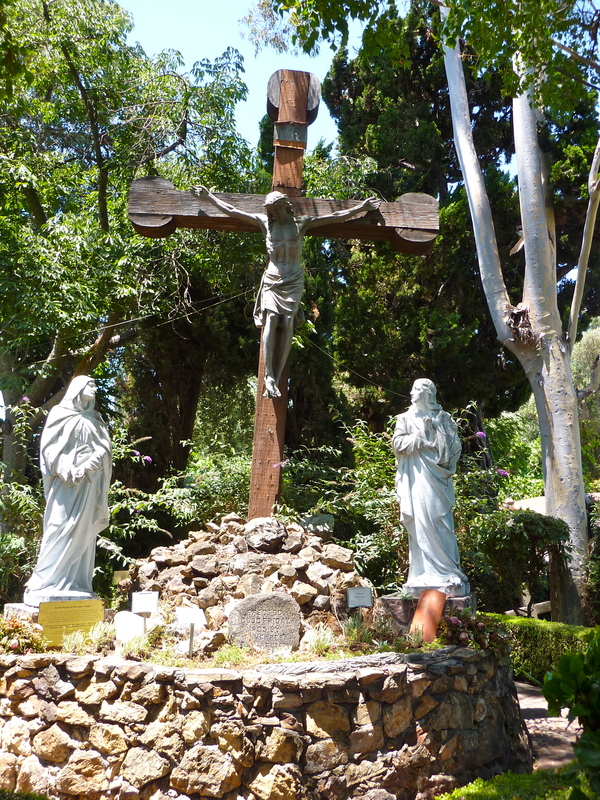 The Campo Santo Cemetery is the oldest cemetery in Los Angeles County (circa 1778) and the Crucifix is the memorial to 6,000 Gabrieleno Tongva San Gabriel Band of Mission Indians buried here, including the first Native American to be buried here. Relations between Native Americans and the Spaniards were not good much of the time. At first, the Indians were cordial and helped with the building of the Mission. 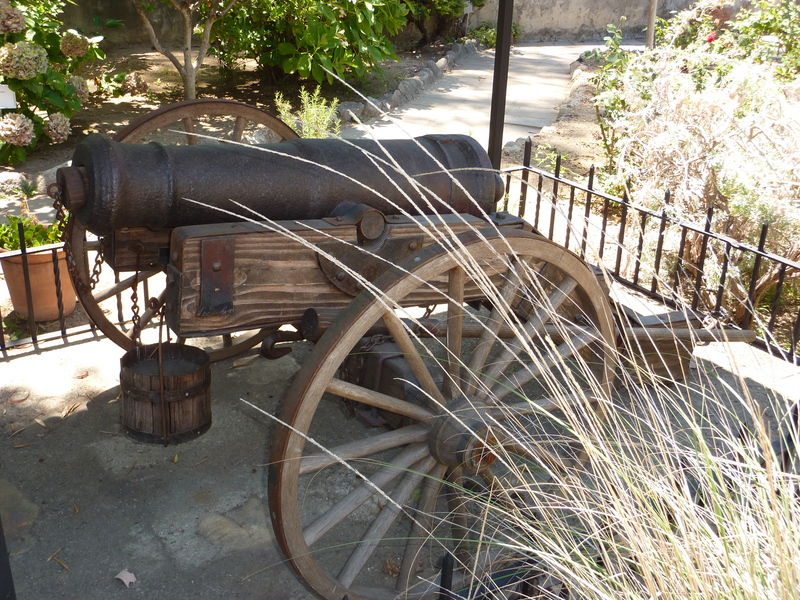 That soured when one of the soldiers attacked a chief’s wife and killed her husband when he intervened. 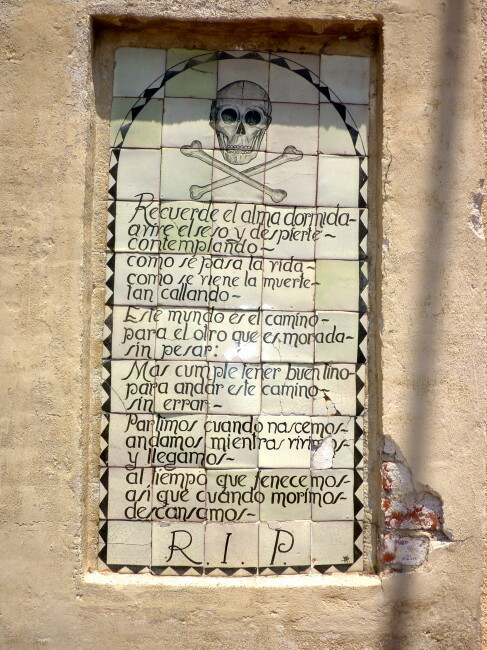 In 1785, a 24-year-old medicine woman, Toypurina, led an Indian revolt at Mission San Gabriel Arcángel. She and three other co-conspirators were tried and punished, however during the trial she said she wanted to be a Christian. Later, she actually married a Spaniard soldier and received a tract of land from the governor. 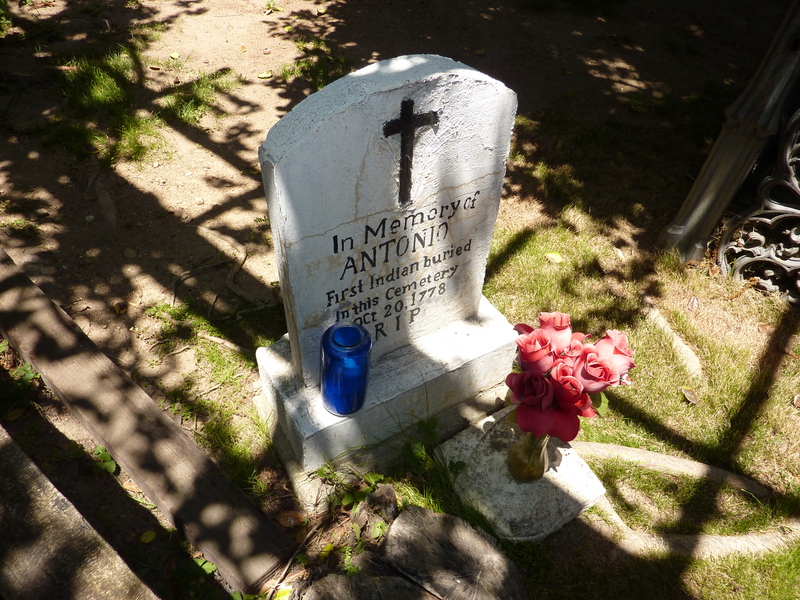 We went inside to look around (and get out of the sun). The main altar was brought to San Gabriel in the 1790s. After visiting the church, we saw the section of the Mission San Gabriel Arcángel that was used to make wine (we could have used some at this moment) and olive oil. 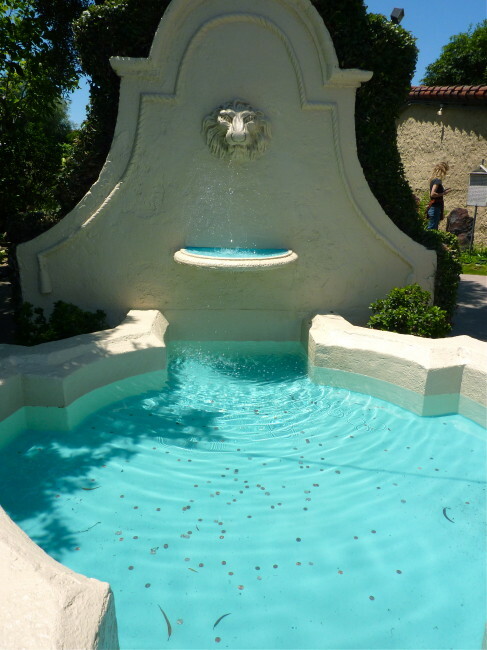 At this time in history, this was the largest winery in the state of California. 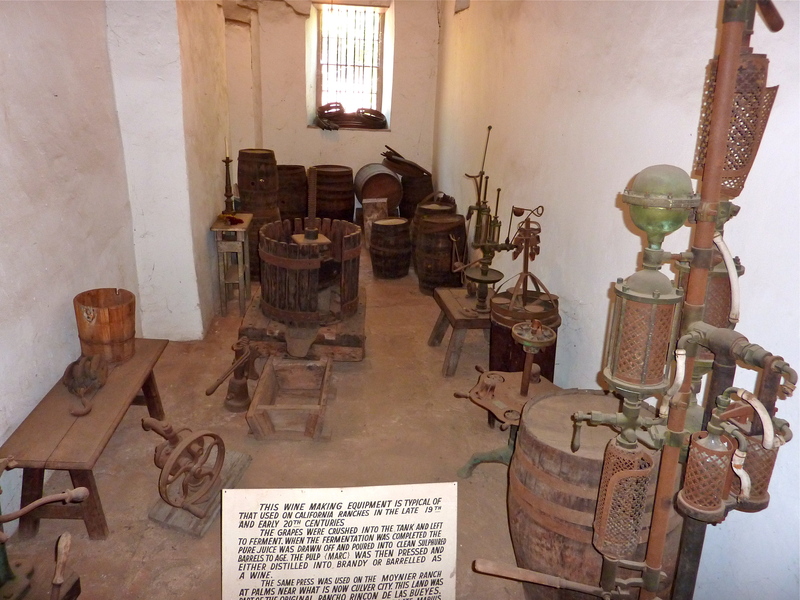 Next up was the Mission Museum (built in 1812) that houses artifacts and collections of garments. 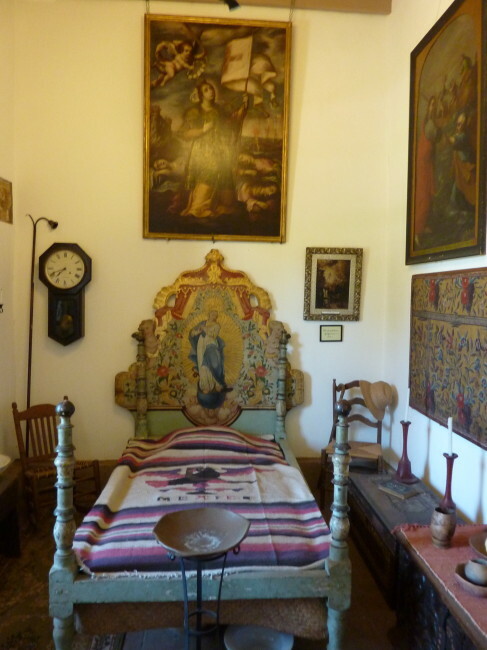 There are books that date back to the late 1490s and a Spanish bedroom set from the early 1600s. 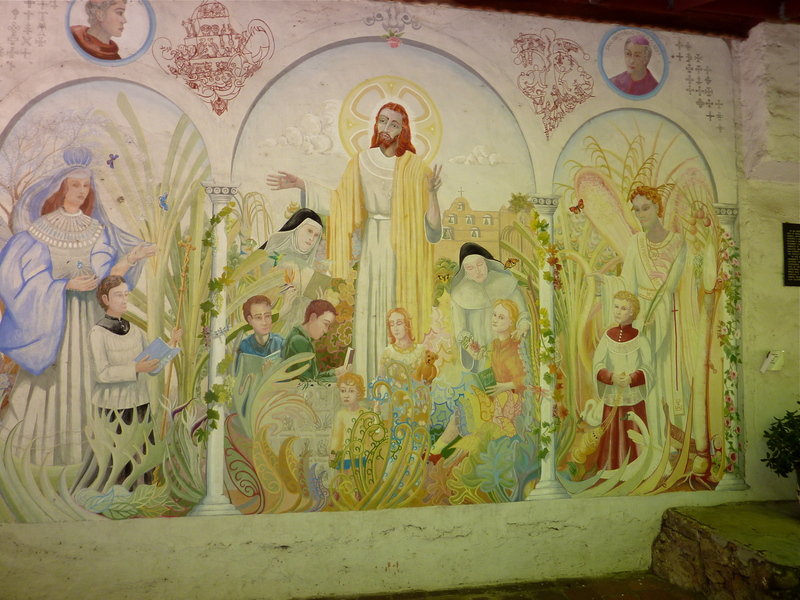 Outside the museum is one of the Mission’s original doors. 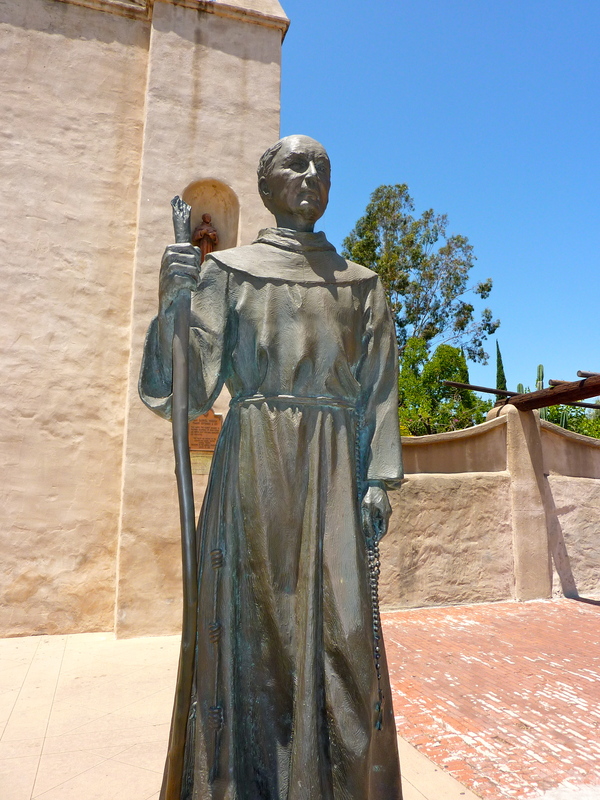 We passed the Quadrangel, which has yet another statue of Junipero Serra, which was erected 150 years after the Mission was founded. I was going to try and get out of the sun in one of the Native American huts, but, as you can see, that idea was less than stellar. 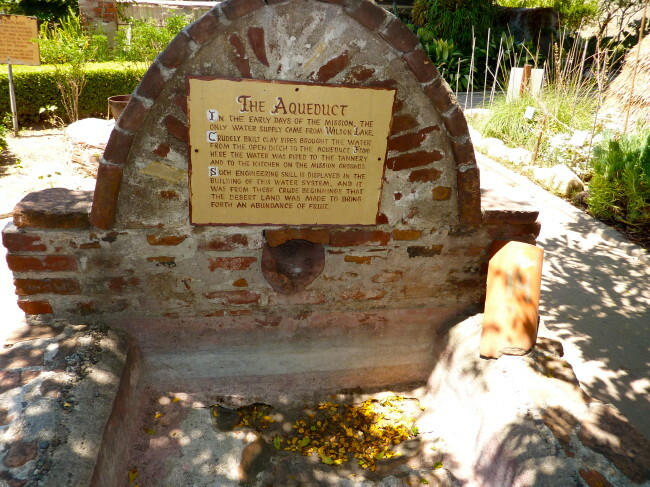 The Mission had an aqueduct that served as the main source of water. 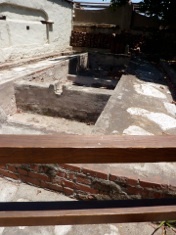 Water was piped from the aqueduct to the laundry, kitchen and various other areas of the Mission. As we walked around the grounds, there was native plant life and some beautiful, purple Dahlias. 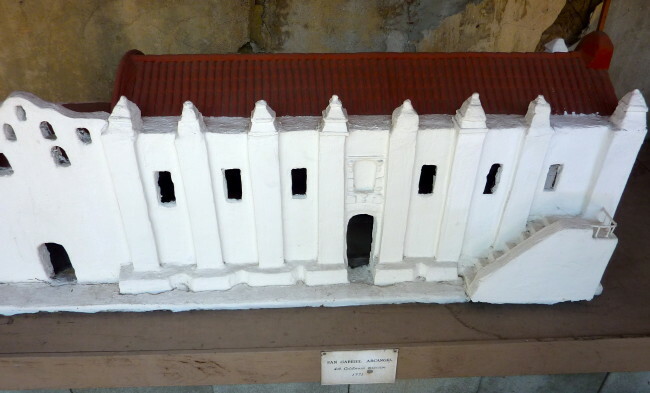 During the early 1800s, Mission San Gabriel Arcángel supplied the other missions with soap and candles, that were made in four large cisterns that were actually soap vats. 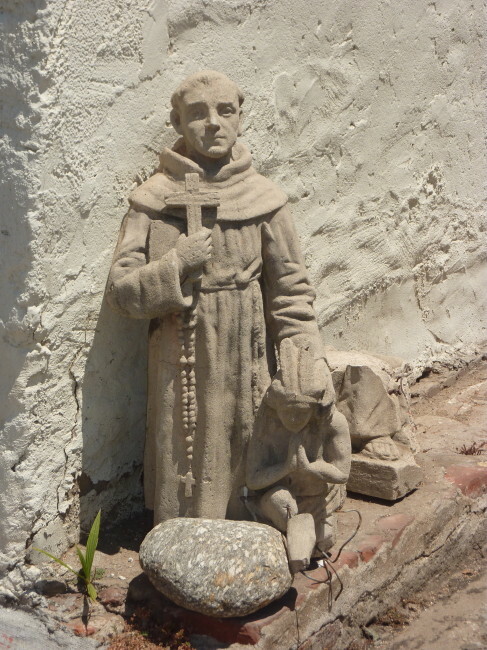 There was also a statue of a padre and a kneeling Native American that seems to show that these Spaniards thought of Native Americans as their “children.” Rather strange. 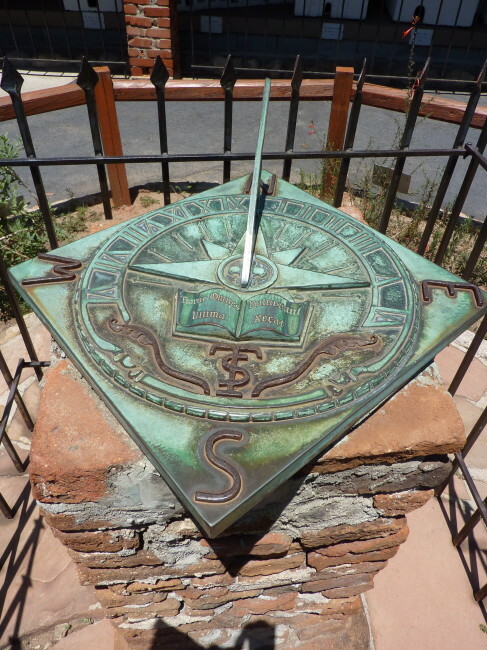 Soon we were at a cannon that had been found after a flood in 1914, a sundial. There were also scale-model replicas of all 21 missions (the one below is this one). 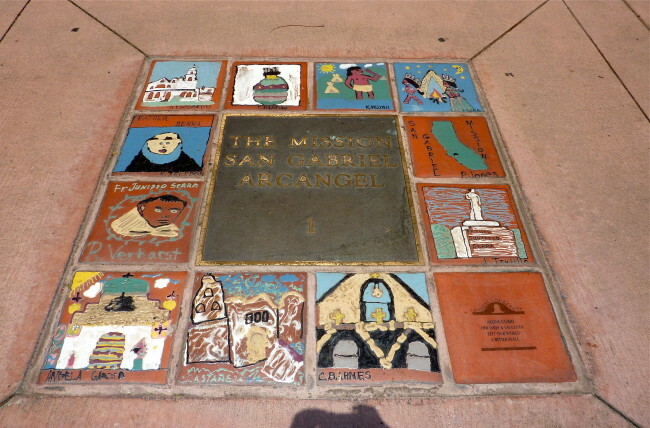 Mission San Gabriel Arcángel was Secularized in 1835 and stripped of all its valuables. Pio de Jesus Pico (the last governor of Mexican Alta California before its surrender and final absorption into the United States) tried to sell the mission to a friend, but he was stopped when United States soldiers arrived. 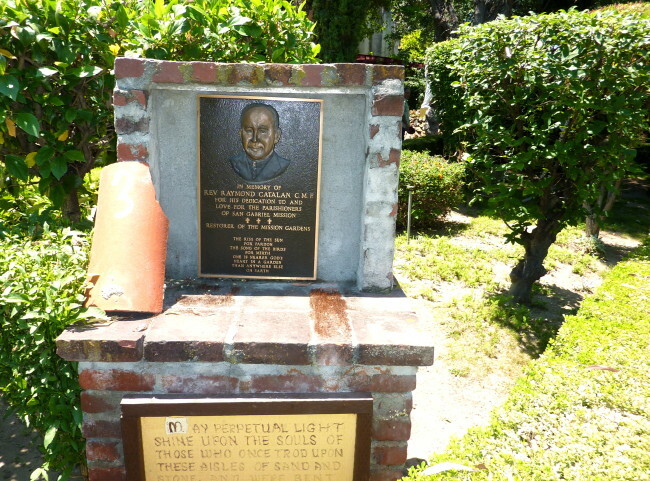 Coincidentally, Pio Pico was born at Mission San Gabriel Arcángel in 1801. In 1862, Congress returned the land to the Catholic church and, in 1908, the Claretan Fathers began to rebuild the Mission. With the temperature continuing to soar, we decided this would be the end of our self-guided tour. 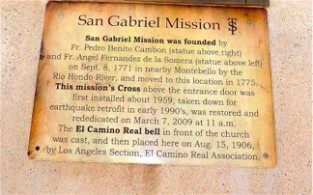 So our first Mission was now accomplished with our visit to Mission San Gabriel Arcángel. Can we hit 20 more? Only time will tell.